I loved it! Call Me, One Way or Another, Heart of Glass, The Tide is High, Rip Her To Shreds, and yes, Rapture. I sang along to those feel-good ditties like nobody's business. Great. Now I'm bummed that I don't have a cassette player so I could listen to that tape again right now...assuming I could even find it. Speaking of rapture, I'm reminded of two ingredients: brown sugar and butter. Yes, brownies are tasty and hit the spot on certain occasions, but for my money, rich, buttery blondies are the way to go. This batch includes two of my favorite non-colored (or is it all-colored?) ingredients--coconut and white chocolate chips. As long as you don't overbake these beauties, they're extremely moist and chewy, with some texture added by the coconut and the chips. Plus, one bowl preparation--huzzah! There's still a little bit of time left for you to enter my macaron giveaway, if you're into that sort of thing. Preheat oven to 350 degrees F. Grease a 13x9-inch pan. In a large bowl, combine the melted butter and brown sugar and mix well. Add the eggs and vanilla and mix thoroughly, 1-2 minutes. Fold in the flour, baking powder, salt, coconut, and white chocolate chips and mix until the dry ingredients are moistened. Scoop into the prepared pan and spread smoothly. Sprinkle the top with a little coconut. Bake 35-40 minutes, turning once halfway through. When the coconut on top and edges are browned and the center is just a little bit soft, remove from the oven. Blondie is the best! And, so are blondies. Love this mix of white chocolate and coconut. Ooooh, I was planning a version of these for next week, we can have a bake-off! These look really rich and buttery! You had me at brown sugar and butter, a great combination for wonderful flavor. And coconut is good too. I love how gooey these blondies look Grace; wish I could reach through the screen and grab some! I love gooey blondies Grace; actually I love anything with butter and brown sugar. Wish I could reach though the screen and grab some bars! You had me at coconut and white chocolate! Are you feeling OK? There is no cinnamon in these. These blondies look DIVINE, Grace. Coconut and white chocolate...I love the combo! Your blondies are so pretty. I love moist and chewy texture. Can't wait to try them out. Those blondies look delicious,Grace! my mother-in-law makes delicious blondies, but this recipe with the addition od cocnut and white chocolate sounds amazing! These look positively chewy-licious. Yum! What a delicious twist on blondies . Perfect for that coconut loving son of mine. My husband is a big fan of coconut! He would love these bars! I'm not a fan of new technology either...change, innovation...totally not my thing lol. but i love blondies. tried true and so delicious. I am a tech addict. I confess. And Blondies made with white chocolate sounds like a brilliant idea to me. 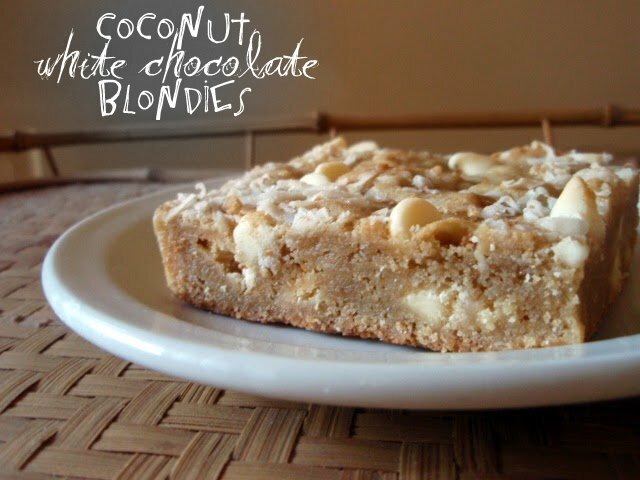 I prefer Blondies too especially with white chocolate and coconut! YUM. I actually had that Blondie album, as in RECORD, when I was a kid that I LOVED and listened to all of the time! I was just telling a friend that I want to make blondies soon. I think "soon" just turned to ASAP because of these. I love white chocolate and coconut too! I literally opened this and said, "Oh s****." I love all of the ingredients in this brownie, especially the brown sugar. This and the butter go great together. ;-) Thanks for sharing. I have one car with a cassette player, and one with an 8 track player. How's that for "behind the times"? I love blond brownies, and these are loaded and wonderful looking! Mmmm, the coconut sounds like a great addition! Finally go around to baking these delicious squares. Took them out of the oven, cooled slightly and withing 1 hour 1/2 the pan was gone!! Hubby, son, nephew and I were having tea and ...... your squares. Thanks.